One of the biggest movements towards even better looking low-budget video production has been the incredible success of DSLR cameras in creating cinematic, crystal clear HD pictures for a fraction of the cost of high-end HD video cameras. Canon took the lead in DSLR video production with the revolutionary Canon 5D Mark II, which has since been replaced by the Mark III. Both shoot in full HD (1080p) and offer video professionals a way to switch lenses easily and use a variety of other camera gear for relatively cheap. While the 5D models still run almost $5,000 with a proper zoom lens, other options like the Canon T3i, Canon 7D, Canon 60D, and now Canon 70D allow videographers to enter the market for barely over $1,000. The revolution is not fueled just by better sensors and better cameras, though, but also by the support gear available for the cameras and the increasing pool of creative, talented shooters. 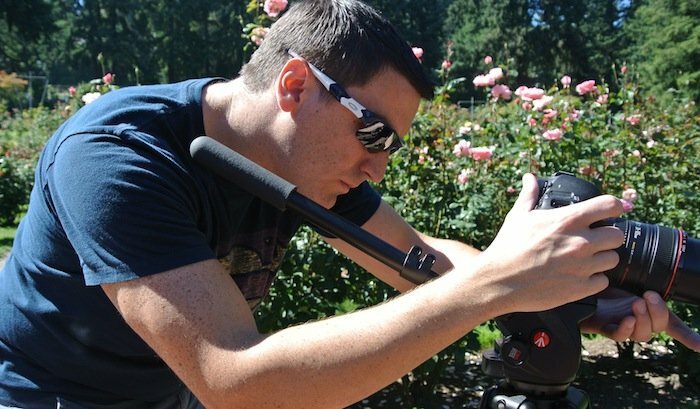 While basic videographers can take nice footage with a solid tripod and mid-level DSLR, the most advanced professionals in DSLR cinematography are using portable jibs (like small camera cranes that can extend 7-8 feet), sliders (for smooth tracking shots), and steadicams (for handheld shots with smooth motion) to enhance the quality of their work. Ultimately, as with any tools that came before, the best footage comes from the best, most creative videographers. With the right tools and a great understanding of cinematography, top DSLR shooters are able to add immense production value to relatively inexpensive videos. For higher end productions, top class professionals will no doubt argue — correctly, for sure — that digital cinema cameras like the RED (One, Scarlet, and Epic), Arri Alexa, and Sony F65 are necessary to create great images that work for any medium. Even so, with the proliferation of Web videos and the need that most companies have for polished, professional productions at reasonable budgets, DSLR cameras allow shooters to keep their day rates low enough to remain affordable for small businesses. The high-end cinema cameras and high-priced operators who accompany them will always have a place with the biggest commercial productions, but DSLR cameras are a perfect fit for most corporate videos and budget-conscious clients. JLB Media Productions maintains a nationwide network of videographers using a variety of cameras, but a large number of our best corporate shooters are using some form of DSLR camera. The convenience is especially pronounced when a videographer also has skill in shooting still photos, because sometimes clients enjoy having both stills and video from a shoot, especially with events. The barrier to entry for video professionals is lower than ever before, which is potentially an incredible revolution in video production, but it also means that finding the best shooters who are truly professional quality is more difficult than in the past. Fortunately, with an established network of shooters with proven talent, we are well positioned to serve our clients in any market.